IMU 033: Esther 'Pinky' Kiss Shares Her Publicity Secrets For How To Get On TV, Connect With Influencers & Create Constant Publicity, Even When You're Nobody! 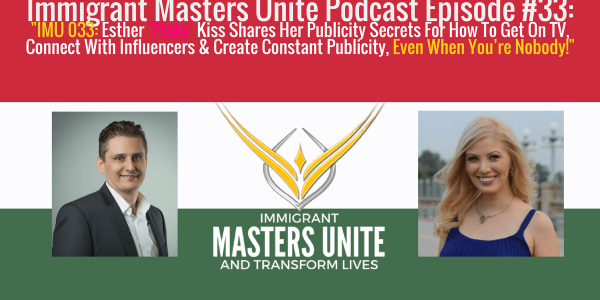 | Immigrant Masters Unite Podcast: Transform Your Business, Life and The World Around You! What if I told you that you can connect with influencers, create constant publicity and get on TV to market yourself or your business & stay there, even if you’re nobody? What if I told you that today’s guest was able to do just that? In fact, she was able to book Gary Vaynerchuk on her podcast before that podcast was even LIVE on iTunes? Would you listen to what she has to say to see how you, as an immigrant can use these same strategies to grow your business and get more exposure for yourself? I know I would! And that’s why I brought Esther ‘Pinky’ Kiss on the Immigrant Masters Unite podcast. You see, when it comes to getting publicity, getting more exposure for yourself and your brand, getting on TV and having media reaching out to YOU to get you in front of their audience, there’s a specific formula that you need to use in order to get noticed. And Esther has figured that formula out and knows how to connect with influencers. How to connect with influencers. More importantly, how to build powerful relationship with them, media personalities and other experts to build your brand and reach for your company. Listen and see if you have the personality to be an influencer yourself. How Esther was able to book an interview for her podcast with Gary Vaynerchuk before she had a platform, was known in the industry and even before her podcast was live on iTunes. See how you can apply her story to use it for your own business, it works! By the way, I am using this strategy to get Gary Vaynerchuk, who you may know is an immigrant, on this podcast! The story of “Taming the Wild Fox” and how it applies to getting constant publicity in your industry. Once you GET this story, you’ll know exactly how to build powerful relationships with people you wouldn’t be able to do otherwise. The top 3 “secrets” you can use right now for connecting with people who are powerful influencers and business leaders in your industry. Hint, the minute you put these experts and influencers on a pedestal, it’s all over! How to get past the gatekeepers, get yourself on their radar and keep yourself alive in their world so next time they need something, they’ll think of you! So, head over to the Itunes or Stitcher right now and listen to the podcast. Once you listen to the episode, share it with at least 3 people you think will benefit from this episode. Most importantly, thank you for listening to this podcast. I truly appreciate it because without you, I wouldn’t be able to do what I do and live my own vision! So, thank you!